Draft: 2004, Florida Marlins, 2nd rd. Jason Matthew Vargas graduated from Apple Valley HS (CA)...Played collegiately at Louisiana State (2002), Cypress College (2003) and Long Beach State (2004)...Named Southern California Junior College Player of the Year in 2003...As a junior, he went 7-4 with a 4.14 ERA and hit .354 with 14 doubles and five homers as a designated hitter...Co-founder of Estrella Youth Sports in Goodyear, AZ, a non-profit youth program. Opened the year on the DL after suffering a non-displaced fracture of the hamate bone in his right hand on March 16...Underwent surgery on March 20 at the Hospital for Special Surgery...Made his season debut and third career start with the Mets on April 28 at San Diego...Was his first start with the Mets since July 3, 2007 at Colorado…Was the fifth Mets player to go at least 10 years between appearances (10 years, nine months, 26 days), joining RHP Jason Isringhausen, RHP Bob L. Miller, catcher Kelly Stinnett and RHP David Cone...Went 5-3 with a 3.60 ERA (20 earned runs/50.0 innings) in his last 10 appearances...The Mets won six of those games...In his first 10 starts of the season, he was 2-6 with an 8.36 ERA (39 earned runs/42.0 innings)...The Mets were 2-8 in those starts...Was placed on the 10-Day DL for a second time on June 24 (retroactive to June 20) with a strained right calf…Returned to the rotation on July 27 at Pittsburgh...Joined the 1,000-strikeout club on August 29 at Wrigley Field vs. the Cubs...In doing so, he became the 141st left-hander in MLB history to reach the milestone...He is also one of 16 active left-handers and one of 61 active pitchers overall to rack up 1,000 strikeouts in his career...Owned a 2.43 ERA (nine earned runs/33.1 innings) over his last six starts (August 24-September 27)...Won five of his last six decisions and threw 5.1 innings or more in seven of his last eight starts...Had pitched 5.0 innings or fewer in each of his first 12 starts. Won seven consecutive starts from May 27-June 30, a new career-high...The streak was the tied for the third-longest streak in the majors behind Clayton Kershaw and Jacob deGrom's eight consecutive win streaks...Posted a sub-2.00 ERA in both April and June…Went 3-1 with a 1.40 ERA (four earned runs/25.2 innings) with two walks and 28 strikeouts in April…Was 6-0 with a 1.98 ERA (nine earned runs/41.0 innings) in six June starts...Was the first pitcher in the majors to reach 10 victories, earning his 10th win on June 18 at Angel Stadium...Led the AL with 12 victories at the All-Star Break...Through July 4, he led the American League in both wins (12) and ERA (2.22), while he ranked in the league's top 10 pitchers in opponent average (.237, eighth), WHIP (1.12, sixth) and walks per nine innings (2.13, fifth)...Held opponents to a .179 average (12-for-67) with runners in scoring position over his first 16 starts…suffered from a .358 (24-for-67) average against with RISP over his remaining 16 outings...Collected six wins in eight day starts, tied for third-most in the AL...Posted a 3.28 ERA (17 earned runs/46.2 innings) in those games. Collected a season-high nine strikeouts on April 19 vs. San Francisco, his highest total since also fanning nine vs. Seattle on June 17, 2013…Was his second-career start with no walks and at least nine strikeouts, also doing it on September 26, 2011 vs. Oakland (10 K, 0 BB)...Beat out a bunt single on June 13 at San Francisco...Was his first hit and at-bat in nearly five years (last, June 20, 2012 at Arizona)...Induced a career-high 22 double plays, which ranked seventh in the American League. Made three starts with Kansas City following his return from Tommy John surgery, posting a 2.25 ERA (3 ER in 12.0 IP), including 5.0 scoreless innings in his last start on Sept. 28 vs. Minnesota...Returned from Tommy John surgery on Sept. 17 vs. the White Sox, allowing just one run on two hits and one walk in 3.0 innings of a 3-2 Royals' win…was his first Major League start since July 21, 2015...According to the database at The Hardball Times, his return from 'Tommy John' surgery (409 days) was the fastest by a Major League starting pitcher since Gavin Floyd (363 days) in 2014...Made six rehab starts across three levels, posting a 5.85 ERA (13 ER in 20.0 IP) with 27 strikeouts (12.2 SO/9) and just one walk (0.5 BB/9). Jason had an injury-plagued season, spending 129 days on the disabled list...made just one start after the All-Star break, suffering a torn ligament in his left elbow on July 21...underwear 'Tommy John' surgery in late July...Went 5-2 with a 3.98 ERA (19 ER in 43.0 IP), 27 strikeouts and 12 walks in nine starts...his nine Major League starts were his fewest since missing the entire 2008 season after undergoing hip surgery in Spring Training...Posted a 3-1 record and a 2.31 ERA (6 ER in 23.1 IP) over his final seven outings of the season...won both of his June starts, defeating Cleveland (4-2) on June 3 and Minnesota (3-1) on June 8...Went 3-0 with a 3.18 ERA (6 ER in 17.0 IP) in three starts against the Tribe. Jason completed his first season in Kansas City, after signing as a free agent with the Royals...Made 30 starts for the fourth time in the last five seasons, despite missing three weeks following an appendectomy in July...Posted a career-best 3.71 ERA...His ERA was also the lowest by a qualifying Royals left-hander since Charlie Leibrandt posted a 3.19 ERA in 1988...His 1.27 WHIP also ranked eighth among A.L. southpaws...Recorded a 1.97 walks per 9.0 innings ratio (41 in 187.0 IP), which tied with Jon Lester for 10th in the American League...His ratio also tied for third among A.L. lefties...Went 5-4 with a 2.73 ERA (26 ER in 85.2 innings) on the road, ranking seventh in the A.L. in road ERA...Went 5-5 with a 4.53 ERA at home...Struggled down the stretch, winning just 3 of his final 12 outings, posting a 4.39 ERA...Had a 3.32 ERA in his first 18 starts...Received just 3.19 runs of support per 9.0 innings after July 4, the eighth-lowest in the A.L. among hurlers that pitched at least 60.0 innings in that span...Posted a 3-3 record, but had a 2.60 ERA (15 ER in 52.0 IP) in 8 starts vs. the A.L. West...His ERA was the fourth-lowest against the West among hurlers with at least eight starts against the division...Took a shutout into the ninth inning in his first home start, April 7 vs. Tampa Bay, but allowed a solo homer to Ben Zobrist to open the ninth...Still earned a 4-2 victory, tossing 8.0 frames, plus one batter...Placed on the 15-day D.L. on July 10, after his appendectomy...He was reinstated on August 2 and started that afternoon in Oakland...Recorded sixth career shutout and 12th complete game August 13, blanking the A's (3-0) on three hits...His six shutouts have all come since 2011, tying him with Texas' Derek Holland for fifth-most in the Major Leagues in that span...Made three postseason starts, going 1-0 with a 3.52 ERA with 11 strikeouts in 15.1 innings...Posted win in Game 4 of the ALCS vs. the Orioles, allowing one run on two hits over 5.1 innings in a 2-1 KC win to complete the four-game sweep. Jason signed a four-year deal with the Royals on November 22, 2013, which runs through 2017, after spending one season pitching for the Los Angeles Angels... Tied for third in the American League with three complete games and two shutouts...shutouts came vs. Baltimore(3-0) on May 3 and vs. Oakland (4-0) on September 24... Went 6-2 with a 3.30 ERA (29 ER in 79.0 IP) in Anaheim...has a career 3.46 ERA in his home starts... Named A.L. Pitcher of the Month in May, going 5-0 with a 2.30 ERA (11 ER in 43.0 IP)...recorded 7.0-plus inningsin seven of his eight starts between April 23 and May 30... Tossed an 8.0-inning complete game on April 28, a 2-1 loss at Safeco Field, allowing two runs on six hits with seven strikeouts... Recorded a season-high nine strikeouts in 11-3 win over Seattle June 17, one shy of his career high which he's accomplished on two occasions... Placed on the 15-day disabled list, retroactive to June 18, with a blood clot in his left arm...returned to the team August 13. Spent fourth full MLB season with Seattle...Led Mariners in wins (14) while setting career highs in starts (33), innings pitched (217.1), strikeouts (141) and quality starts (22)...Ranked amongst AL leaders in games started (33, T4th), quality starts (4th, 22), innings pitched (6th, 217.1), WHIP (10th, 1.178) and complete games (T10th, 2)...Ranked T2nd in AL allowing 35 HR...Tossed at least seven innings in 14 of 33 starts...Recorded five starts allowing one or fewer runs in at least 8 IP...Was 10-4 with 2.94 ERA in 18 starts after a loss...Named AL July Pitcher of Month after going 5-0 with a 1.64 ERA...Tied M's club record for most wins in a month...Career-high five-game win streak July 7-31 (5-0, 1.75 ERA)...Recorded sixth career CG July 7 at Oakland, retired 13 straight from 3rd-7th inning and induced four GIDPs to tie club record...Tied career high with 10 strikeouts June 26 vs. Oakland (ND, 6.2 IP). Went 10-13 with a 4.25 ERA (95ER, 201.0 IP) in 32 starts with 4complete games and 3 shutouts ... Set career highs in strikeouts(prev: 116 in 2010), wins (prev:8 in 2010), innings (prev: 192.2in 2010) and starts (prev: 31 in2010) ... T3rd in AL with 3 shutouts (4 ledleague) and T4th with 4 CG ... Tossed 3 shutouts over a 6-startspan from June 3-July 1: June 3vs. TB, June 19 vs. PHI and July 1 vs. SD ... Ranked T3rd in club history with 3 shutouts, behind Randy Johnson (4, 1994) and DaveFleming (4, 1992)...first Mariners pitcher to have at least 3 shutouts in a season sinceFreddy Garcia (3, 2001)...tied Mariners record for single-season home shutouts: MikeMoore (1988), Brian Holman (1991) & Dave Fleming (1992) each threw 3 shutouts in oneseason at the Kingdome ... Tossed a pair of CG shutouts in June: June 3 vs. Tampa Bay & June 19 vs. Philadelphia...became 5th pitcher in club history to post multiple shutouts in a month (Randy Johnson- 4x, Freddy Garcia, Mike Parrott, Mark Langston), and first since Garcia in July 2001 ... Had run support average of 3.40, 2nd-lowest in the AL...9-2 when receiving at least 3runs of support (13 GS) ... Received 2 or fewer runs of support in 19 of 32 starts, including 10 of last 15 GS...sincestart of 2009, has the lowest run support average in AL (3.45); has started 77 games since2009, and his team has scored 2 runs or less in 49 of them ... Recorded career-high 10 strikeouts in final start of year Sept. 26 vs. Oakland ... Finished season 3-0, 2.03 in final 4 starts Sept. 8-26 (26.2 IP, 6 ER, 5 BB, 23 SO); teamwas 4-0...followed stretch of 11 starts July 6-Sept. 2 in which was a combined 1-8, 6.49ERA (44 ER, 61.0 IP)...began year 6-5, 3.57 ERA (17 GS, 113.1 IP, 45 ER), including going2-2, 2.82 in 5 starts in June ... Recorded 9.0 shutout innings May 12 at Baltimore (9.0,7,0,0,1,4) but recorded a ND in 2-1loss (12 innings)...joins Tim Belcher (6/4/95 at BOS), Erik Hanson (10.0 IP, 8/1/90 at OAK)& Mike Moore (6/29/88 vs. TEX) as only pitchers in club history with at least 9.0 shutoutinnings to not earn a win ... Snapped career-high 9-game losing streak with W#1 April 29 at Boston (7.0,8,4,4,2,4,2HR)...was first win since Aug. 14, 2010 atCleveland. Named Mariners Unsung Heroby the Seattle chapter of theBBWAA...Set career-highs in wins (9, oldwas 5 in '05), innings (192.2, oldwas 91.2 in '09), games (31, oldwas 23 in '09), starts (31, old was14 in '09) and strikeouts (116, oldwas 59 in '05)...Ranked T8th in the AL with 21quality starts...Had the 3rd-lowest run supportaverage among AL starters (3.46)...received 2 or fewer runs of support in 20 of 31 starts...Went 7-5, 2.86 (33 ER, 103.2 IP) in 16 home starts...career 2.84 ERA at Safeco Field, 2ndlowestamong all pitchers (min. 15 GS), trailing only John Lackey (2.78)...Career-high 4-game winning streak May 9-June 22 (4-0, 2.11 in 9 GS, allowing 14 ER in59.2 IP)...also won 3 consecutive starts Aug. 3-14 (3-0, 2.84)...Limited left-handed batters to a .200 average (36x180), 9th-lowest in the AL...Tossed at least 7.0+ innings in 12 starts (6-2, 1.68)...lasted at least 6.0+ innings in 24 of31 starts (77%)...Was 9-5 and ranked 10th in the AL in ERA (3.15) through his first 23 starts of the season(through 8/15)...went 0-7, 5.74 (30 ER, 47.0 IP) over final 8 starts...At the All-Star break was 6-4 with a 3.09 ERA...ranked T9th in AL in ERA...Struck out career-high 9 batters July 18 at LAA...also had 8 K's May 4 vs. Tampa Bay...Recorded loss in 7 consecutive starts Aug. 21-Sept. 24 (0-7, 6.59)...Threw 7.0 ShO innings, allowing 4 hits, 1 walk and struck out 7 June 22 vs. Chicago Cubs. Set career-highs in games (23),starts (14), and innings (91.2)...Had 3 stints with the Marinersafter missing the entire 2008season with recovering from lefthip surgery in 2007...Was 1-0, 2.87 ERA (5 ER, 15.2 IP)in 9 relief appearances, tossing2.0 or more innings in 5 games...Went 1-1, 2.60 ERA (10 ER, 34.2IP) in first 6 starts of the season,allowing 3 runs or less in eachgame, including 5 games of 2runs or less...Seattle won 4 of those 6 games...in his final 8 starts, went 1-5, 7.62 ERA(35 ER, 41.1 IP), allowing 5 or more runs in 5 of those games...In 6 no-decisions, had 2.56 ERA (9 ER, 31.2 IP)...allowed 2 runs or less in 5 of 6 GS...Held opponents to .194 (6x31) batting average with runners in scoring position, two outs...Was 1-1, 2.94 ERA (11 ER, 33.2 IP) in 6 starts at Safeco Field...had 1.52 ERA (5 ER, 29.2IP) in his first 5 home starts before allowing 6 R in his last start July 26 vs. Cleveland...Tossed a season-high 7.0 innings three times: May 22 vs. SF (1 ER), June 20 vs. ARI (1ER) and Aug. 6 at KC (7 ER, including 5 in the first inning)...Earned win in Mariners debut May 3 vs. Oakland by tossing 2.1 innings in 15-inningvictory, striking out 4,...first ML appearance since July 3, 2007 and first ML victory sinceApril 13, 2006...Started the season with the AAA Tacoma Rainiers...went 1-2 with a 2.93 ERA (9 ER, 27.2IP) in 5 starts before being recalled. Did not pitch in 2008...underwent surgery to repair the labrum in his left hip on March 17...Spent the summer rehabing at the Mets minor league complex in Port St. Lucie, FL...Pitched for the Peoria Saguaras of the Arizona Fall League...Went 1-0 with a 2.10 ERA (6 ER, 25.2 IP) in 9 games (1 GS) in the Fall League...Held opponents to a .208 (20x96) average, including .200 (7x35) vs. left-handers. Had a bone spur removed from his left elbow on October 3, 2007...Mets Medical Director Dr. David Altchek performed theprocedure at the Hospital for Special Surgery in Manhattan...Was recalled from New Orleans (AAA) of the Pacific Coast League on May 17th...Started that afternoon vs. the Cubs...Retired thefirst nine batters he faced...Worked 7.0 innings, allowed six hits, five runs, earned, with two strikeouts and had a no-decision in agame the Mets rallied to win, 6-5, with five runs in the ninth inning...Optioned back to the Zephyrs on May 25th...Recalled for a second and final time on July 3rd...Optioned back to New Orleans onJuly 4th...Allowed a career-high 11 hits and nine runs on July 3rd at Colorado...Suffered the loss as the Mets fell, 11-3...Was 3-1 with a 3.23 ERA (11 earned runs/30.2 innings) in June for the Zephyrs and 2-1 with a 2.89 ERA (nine earned runs/28.0innings) in August...Was second on the Zephyrs' staff in starts, wins, innings pitched and strikeouts. Began the season in the Marlins' starting rotation...Optioned to Albuquerque (AAA) of the Pacific Coast League on May 14...Recalled from Triple-A on July 6 and optioned back to Albuquerque on July 29...Picked up his lone victory against the Padres at home on April 13...Went 6.0 innings and gave up two hits, two runs, earned, with five walks and three strikeouts...Had a no-decision on April 24 against the Cubs in a 6-3 loss in Miami...In 6.1 innings, he permitted one hit, with no runs, four walks and two strikeouts...His fifth and last start was a no-decision against Colorado at home on April 29...Made four relief appearances from May 4-May 12...Also had three outings out of the bullpen from July 6-July 29...With Albuquerque, he went a season-best 8.0 innings to turn back Memphis on June 8...Fashioned a 2.25 ERA (two earned runs/8.0 innings) in six regular season appearances with Leones del Escogido in the Dominican Winter League. Made 17 appearances (13 starts) for the Marlins in rookie campaign, compiling a 5-5 record with 4.03 ERA... entered startingrotation in July, and went 4-5 as a starter with 4.14 ERA ... became fifth Marlins left-hander to collect five or more winsin rookie season... As a reliever, went 1-0 with 2.84 ERA in four relief outings while limiting opposing hitters to a .143 batting average... recorded first Major League victory in third relief appearance on July 27 vs. Pittsburgh, tossing 3.0 no-hit innings, while fanning five batters after a 42-minute rain delay... registered scoreless appearance in three of four relief outings... Made first Major League start on July 18 at Arizona, allowing three runs (two earned) on four hits and four walks with threestrikeouts in 5.0 innings en route to a no-decision... picked up consecutive victories in next two starts, August 5 at Cincinnati and August 10 vs. Arizona, allowing a combined two earned runs in 11.1 innings pitched with seven strikeouts... went 4-1 with 3.22 ERA in his first six starts for the Marlins, from July 18 to August 26, while holding hitters to a .217 average... Registered first career complete-game victory on August 21 vs. Los Angeles (NL), allowing one run on six hits (1 BB, 7 SO)...became the first National League rookie to toss a complete game on the season and the first Marlins rookie to pitch anine-inning complete game since Dontrelle Willis on June 16, 2003 vs. New York (NL)... it was the fourth time a Marlins rookie pitched a nine-inning complete game... joined Brian Meadows as the only Marlins pitchers in team history to requireas few as five starts to record their first complete game... Struck out a season-high seven batters in back-to-back starts, August 16 vs. San Diego and August 21 vs. Los Angeles(NL)... held opponents to a .249 average including a .192 average (0 HR) against left-handed hitters... tossed 44.2 inningsbefore surrendering first home run on August 31 to David Eckstein of St. Louis... allowed a season-high seven runs on 10hits on August 31 vs. St. Louis... issued a season-high five walks on August 16 vs. San Diego... Over his final seven starts, went 0-4 with 5.23 ERA, despite allowing more than three runs only once... during the span,opponents hit for a .302 average, while Florida maintained a 1.16 run support average... recorded shortest start of seasonin last start on October 1 vs. Atlanta, tossing 1.0 inning before a rain delay... At the plate, batted .308 (8x26) with two doubles, two RBI, and three runs scored... doubled in first Major League at batoff Arizona's Mike Gosling and scored first run on July 18... drove in two runs on August 21 vs. Los Angeles (NL)... collectedfirst multi-hit game of career on August 26 at Chicago (NL), going 2x3 with a run scored... Selected from Carolina (AA) on July 14, after going a combined 7-4 with 2.50 ERA in 17 starts between Greensboro (A),Jupiter (A) and Carolina... Went 4-1 with 0.80 ERA in five starts at Greensboro... went 2-3 with 3.42 ERA in nine starts atJupiter... went 1-0 with 2.84 ERA in three starts with Carolina... Named the Marlins Organizational Pitcher of the Month for April, going 4-1 with 0.80 ERA (33.2 IP, 3 ER) and 33 strikeoutswith Greensboro... garnered Minor League Player of the Week honors for the week of April 18-24, going 2-0 with 0.00 ERA(13.2 IP), 16 strikeouts... led all Florida farmhands in 2005 with a 2.50 ERA... received a single third-place vote for NationalLeague Rookie of the Year...voted the Marlins Rookie of the Year by the Soth Florida chapter of the BBWAA. In his first pro season, split time between Jamestown and Greensboro, combining for a 5-2, 2.09 record in 11starts (60.1IP, 14 ER)... was the Marlins Organizational Pitcher of the Month for August, after going 2-0, 1.41 (32.0 IP, 5 ER) with 30strikeouts... was named the #3 prospect in the New York Penn League by Baseball America. July 27, 2018 New York Mets activated LHP Jason Vargas. July 9, 2018 New York Mets sent LHP Jason Vargas on a rehab assignment to Brooklyn Cyclones. April 28, 2018 New York Mets activated LHP Jason Vargas from the 10-day disabled list. April 23, 2018 New York Mets sent LHP Jason Vargas on a rehab assignment to Las Vegas 51s. 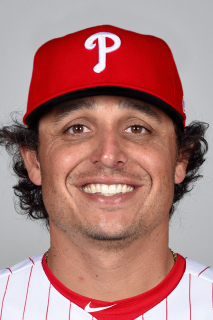 February 18, 2018 New York Mets signed free agent LHP Jason Vargas. November 2, 2017 LHP Jason Vargas elected free agency. September 17, 2016 Kansas City Royals activated LHP Jason Vargas from the 60-day disabled list. August 22, 2016 Kansas City Royals sent LHP Jason Vargas on a rehab assignment to Omaha Storm Chasers. August 17, 2016 Kansas City Royals sent LHP Jason Vargas on a rehab assignment to Northwest Arkansas Naturals. August 7, 2016 Kansas City Royals sent LHP Jason Vargas on a rehab assignment to AZL Royals. November 5, 2015 Kansas City Royals activated LHP Jason Vargas from the 60-day disabled list. September 1, 2015 Kansas City Royals transferred LHP Jason Vargas from the 15-day disabled list to the 60-day disabled list. Left ulnar collateral ligament tear. July 22, 2015 Kansas City Royals placed LHP Jason Vargas on the 15-day disabled list. Left ulnar collateral ligament tear. July 21, 2015 Kansas City Royals activated LHP Jason Vargas from the 15-day disabled list. July 13, 2015 Kansas City Royals sent LHP Jason Vargas on a rehab assignment to Northwest Arkansas Naturals. May 26, 2015 Kansas City Royals activated LHP Jason Vargas from the 15-day disabled list. October 2, 2014 Kansas City Royals activated LHP Jason Vargas. September 30, 2014 Kansas City Royals reassigned LHP Jason Vargas to the minor leagues. August 2, 2014 Kansas City Royals activated LHP Jason Vargas from the 15-day disabled list. November 21, 2013 Kansas City Royals signed free agent LHP Jason Vargas. August 13, 2013 Los Angeles Angels activated LHP Jason Vargas from the 15-day disabled list. August 8, 2013 Los Angeles Angels sent LHP Jason Vargas on a rehab assignment to Salt Lake Bees. June 21, 2013 Los Angeles Angels placed LHP Jason Vargas on the 15-day disabled list retroactive to June 18, 2013. Blood clot left armpit. December 19, 2012 Los Angeles Angels traded 1B Kendrys Morales to Seattle Mariners for LHP Jason Vargas. September 1, 2009 Seattle Mariners recalled Jason Vargas from Tacoma Rainiers. August 7, 2009 Seattle Mariners optioned Jason Vargas to Tacoma Rainiers. July 26, 2009 Seattle Mariners recalled Jason Vargas from Tacoma Rainiers. July 20, 2009 Jason Vargas roster status changed by Tacoma Rainiers. July 9, 2009 Seattle Mariners optioned LHP Jason Vargas to Tacoma Rainiers. May 1, 2009 Seattle Mariners recalled Jason Vargas from Tacoma Rainiers.